Dark garnet color. Fruity, inviting aromas of blackberry, blueberry, cinnamon, and cocoa powder with a soft, dry medium-to-full body and a warming, interesting, medium-long , and vanilla pudding finish with well-integrated tannins. A supple, velvety Merlot blend with a lingering finish. Bottom Line: A supple, velvety Merlot blend with a lingering finish. 91 • Fifteen Appellations by Italics 2011 Red Meritage, Napa Valley 14.7% (USA) $95.00. 90 • Fifteen Appellations by Italics 2010 Meritage, Napa Valley 14.7% (USA) $115.00. 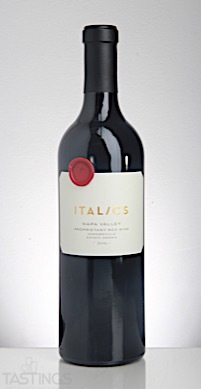 94 • Italics 2012 Estate Grown, Cabernet Sauvignon, Napa Valley 14.5% (USA) $125.00. 91 • Italics 2013 Estate Grown, Cabernet Sauvignon, Napa Valley 14.8% (USA) $95.00. 96 • Italics 2014 Estate Grown Proprietary Red Wine, Coombsville, Napa Valley 14.6% (USA) $65.00. 92 • Italics 2014 Sixteen Barrels Produced White Blend, Napa Valley 14.5% (USA) $48.00. 91 • Italics 2013 Sixteen Appellations Red Blend, Napa Valley 14.5% (USA) $75.00. 94 • Italics 2014 Estate Grown, Cabernet Sauvignon, Coombsville, Napa Valley 14.6% (USA) $95.00. 91 • Italics 2017 Viognier, Oak Knoll District, Napa Valley 14.6% (USA) $.00. 92 • Sixteen Appellations 2012 Red Blend, Napa Valley 14.5% (USA) $95.00. 91 • Sixteen Appellations 2013 Red Blend, Napa Valley 14.5% (USA) $75.00. Italics 2014 Estate Grown Proprietary Red Wine, Coombsville, Napa Valley rating was calculated by tastings.com to be 96 points out of 100 on 7/21/2017. Please note that MSRP may have changed since the date of our review.